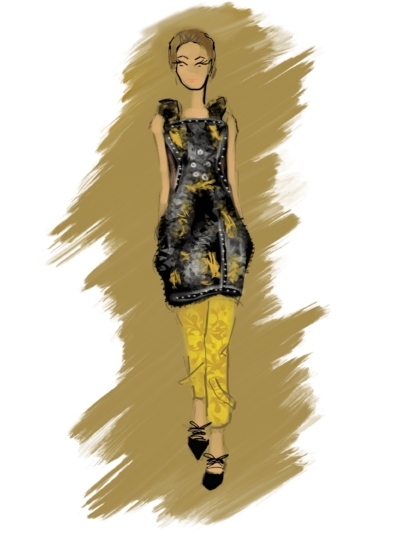 London Fashion Week, the second in my Fashion Week Illustrated series! London can always be depended on to keep things interesting, innovative and just down right funky. It tends to have a rebellious cool-factor compared to the other cities. Even when fashion was trending towards minimalism, it has always been a go-to for me for some serious inspiration. I'm sure everyone who hears Burberry immediately thinks of the iconic plaid print and rain coats, I still do myself. But, have you ever seen a Burberry runway show? They take the classic British style add on a level of eccentricity that is just that much better. I opted for a poncho and maxi skirt look, the bright earth-tones against the grey lavender skirt was a colour combination I had never seen but can't stop thinking about now. One of my favourite collections at LFW, I loved the military-inspired jackets and jumpsuits from Temperley London this season. Another unlikely colour combination, the gold and bright magenta badges adorning the army green fabric really caught my eye. Always an incredible source of inspiration for prints, the collection this year was called "Interior Lives" and makes a lot of creative references to various classic interior design shapes and patterns. I especially liked this tapestry inspired piece. Anyone who knows me knows that everything Delpozo is AMAZING in my mind. The designer, Josef Font, to me is a genius with shape and silhouette and colour. There is nothing like the Delpozo aesthetic. Sketching the show backstage last year was a surreal experience, so I was excited to see a new collection. As always, it has an effortless complexity to it that is so clean and impactful. Psychadelic prints on silk is always a win in my opinion. I'm keeping an eye on this designer for future collections. What drew me to this collection was the sheer polka dot fabric used throughout. I've been playing around with a new black and white series with this fabric, so I was pleasantly surprised to find a whole new source of reference for it from the latest Erdem collection. I chose this look to sketch because I can never resist a good mask/veil to add in some runway drama. That's a wrap for London, but check back soon for Milan!